We would like to give special thanks to our collaborators and friends Maggie Rosas and Miguel Ramirez. Without their hard work, contributions and insight, this article wouldn’t have been possible. 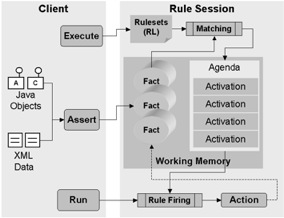 In this article, we will dive into the discussion of how and where Oracle Business Rules fits into a Service Oriented Architecture. Furthermore, OBR’s evolution along Oracle’s FMW stack will be revisited, as well as its importance, benefits and the best practices to implement this product based on our own experience. In many customers / projects we have faced a lot of resistance spearheaded by inaccurate conclusions around OBR’s scope, capabilities, performance and overall reliability as a component of Oracle SOA Suite. This kind of concerns, can frequently lead organizations to underestimate the tool’s potential or even to abandon its use altogether, selecting instead suboptimal alternatives for business rules implementation and management. First and foremost, let’s take a look at how any business rule engines may fit into a technological architecture based on service-orientation principles. It is very important to take in account that from a theoretical / methodological standpoint, “Rules Centralization” is in fact an established SOA design pattern, related to both the “Orchestration” and “Enterprise Service Bus” compound patterns. Rules Centralization is also one of the “Inventory Centralization Patterns”, along with Policy, Schema and Process Centralization. Read the complete article here.